2012 Princess 60 Flybridge Motor Yacht. Twin Volvo D13 800HP engines with 450 hours. Specification includes; White Hull, Serotina cherry interior woodwork, satin finish, Aztec brown galley worktop,Aft cabin fit out, Yacht controller, Electric stern winches,Simrad NSE 12 multifunction 12.1 inch brilliant colour display to upper helm.Bow and stern thrusters,ONAN 13.5kW diesel generator,Reverse cycle air- conditioning/heating,Holding tank,Teak laid flybridge, cockpit and side decks, Passerelle (letterbox type) fitted with automatic handrails, Hydraulically operated blue bimini top with illumination, Dishwasher to galley,New leather interior upholstery 2017, New exterior upholstery 2017. 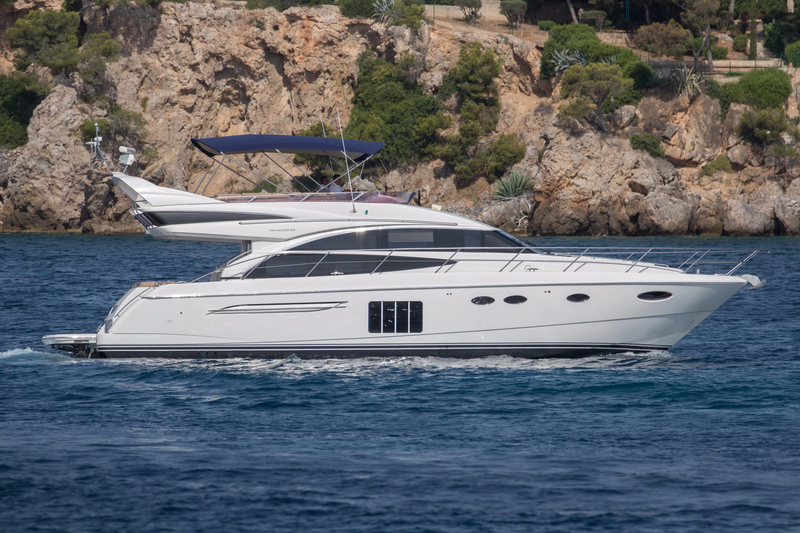 Please call Boats.co.uk on 01702258885 or email Sales@boats.co.uk today to arrange a viewing of this stunning example. Sunbather - Flybridge sunbed and cushions, Cockpit and flybridge seating including helm seats and sunbed cushions in Movida Metallic contrasting and stitching and self coloured piping beige with white upstands. Buy this boat for as little as £8,683.80 per month. Insure this boat for as little as £5,658.00 per year.